Serious restaurants tend to emphasize dinner, arguably the day’s most serious meal. But lately, it seems like many of the most exciting openings are putting the mojo back into the morning meal, so much so that breakfast has become — dare we say? — exciting. There are grab-and-go pastries, healthyish options that go far beyond avocado toast, burritos stuffed with biscuits, and, yes, a few brunch options. In other words, you have plenty of good reasons to skip the morning yogurt and start the day somewhere besides your desk. Looking for a more virtuous breakfast, with vegetables sans the mock-burgers? 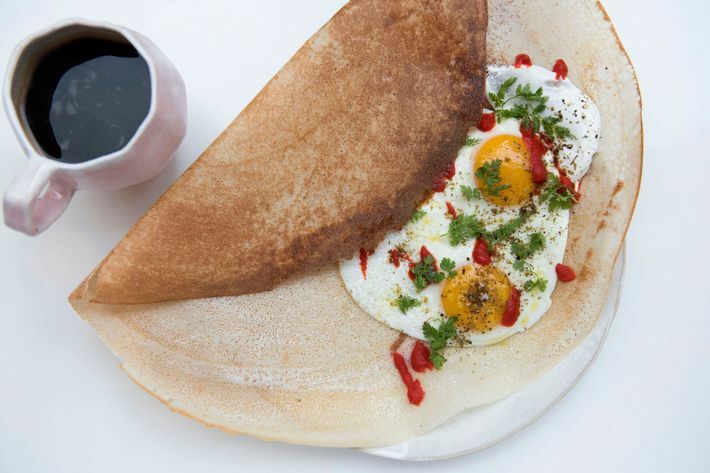 Jean-Georges Vongerichten is feeling the greens at his latest restaurant, where they’re serving a trio of dosas for breakfast. There’s one with yogurt and avocado, another with farm butter and maple syrup if you want a touch of pancake, and a third with fried egg, za’atar, and Swiss chard. At the bakery and cafe attached to Union Square Cafe, they’re serving gougères, France’s savory choux pastries, with fillings like ham, pepper-jack cheese, and “green” eggs cooked with spinach. Andrew Carmellini’s restaurant in the William Vale Hotel serves breakfast daily, meaning you can start off any — or every — day of your week with baba au rhum French Toast made with cream, rum-raisins, and guanciale for salty savoriness. At this Nolita café for the nutritional yeast loving Dimes set, bowl-savvy chef Camille Becerra serves a sequel to her Dragon Bowl. Here, it’s made with with seaweed, cured fish, pickles, and a hippie-fied gomasio made with hemp and red shiso. The café and roaster also recently introduced a few spins on the breakfast buritto, like this Southern-ish one made with scrambled eggs, pork sausage, cheddar, frie- scallion biscuit, and rosemary gravy. From the mornings through early afternoons on weekdays, the Flatiron spot serves coffee and a selection of traditional French pastries from a counter. Go beyond croissants and try the fougasse, a fancy Provençal bread made here with anise and, instead of the traditional orange, apricot. It might be too early for pizza, but Ivan Orkin and chef Michael Bergemann’s new Gotham West Market stall also functions as a coffee shop with creative pastries. During your morning coffee run, swap out the usual olive oil cake for an olive oil-pistachio muffin, an Italian-American spin on the breakfast classic. The Williamsburg restaurant’s weekend brunch proved so popular it started serving it daily. For late risers who aren’t tied to desks, there’s plenty to feast on. 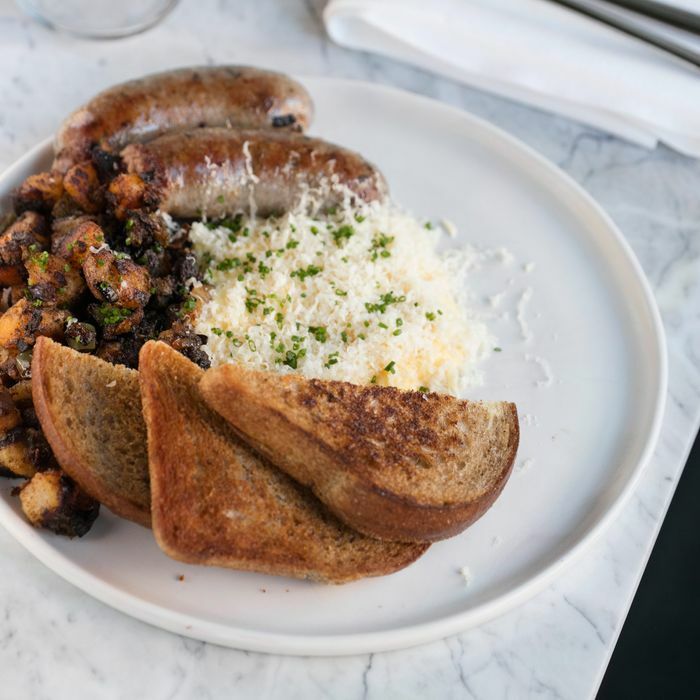 Maybe the Elvis sandwich with charred banana, house fluff, and sunflower butter, or, if you’re in an eggs mood, the cheddar scramble with home fries and breakfast sandwich or avocado. As part of its freshly launched brunch, the West Village restaurant serves an Italian-ish take on the classic breakfast sandwich, here made with stracciatella instead of American cheese, plus mustard greens and juicy campari tomato. In the mornings, the French restaurant serves a light menu of coffee and snacks like banana bread, with slices of the fruit baked in, and another inspired by the rarer citron. Here, it’s pound cake with lemon and orange zest and vanilla mixed into the batter. Pie for breakfast raised another question: Can you eat chocolate for brunch? At this Bushwick pizzeria, yes, where the new brunch menu includes a chocolate-ricotta pie garnished with wedges of blood orange, navel oranges, and oro blanco grapefruit.